Ryan Blaney and the No. 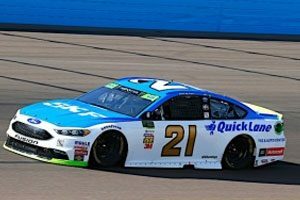 21 SKF/Quick Lane Ford team came up short of being among the four drivers and their teams that will compete for the Monster Energy Cup Series championship at Ford Championship Weekend at Homestead-Miami Speedway next week. 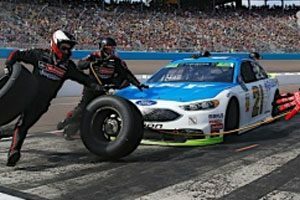 But despite fading to 17th place at the finish of Sunday’s Can-Am 500 and coming 23 points shy of advancing, they left Phoenix Raceway with their heads held high after a season full of amazing accomplishments. “It’s disappointing, but at the same time we have a lot to be proud of for sure,” Blaney said in his post-race comments. “The nine weeks that we had [in the playoffs] is something to be proud of. Blaney started Sunday’s 312-mile race from the pole and led the first 11 laps, but it was soon apparent that his SKF/Quick Lane Fusion wasn’t fast enough to win the race, which was his most realistic option for advancing to the championship round at Homestead. Still, he and the team battled hard throughout the race and found themselves in the top five as the laps wound down. But to keep that track position meant staying on the track during late-race cautions, and staying on the track ended up putting him at a disadvantage to drivers behind him with fresher tires. That’s not to say Blaney and the team didn’t put forth a 100-percent effort. “We did a good job on restarts,” Blaney said. “I thought we were decent on restarts all day. We were able to start up towards the front and just didn’t work out for us. Team co-owner Len Wood echoed Blaney’s comments about the team having a lot to be proud of, including a win at Pocono, poles at Kansas and Phoenix and a nine-week run in the playoffs. Wood also said he’s proud to have two Ford teammates among the four competing for the title in Ford Championship Weekend. “We’re proud to have Team Penske’s No. 2 team and their driver Brad Keselowski among the final four along with Kevin Harvick from Stewart-Haas Racing,” Wood said. “It’s good to see half the championship contenders carrying the colors of Ford Motor Company, and we hope to have a great run ourselves in the Ford 400 as we say goodbye to Ryan Blaney and Jeremy Bullins, who have made major contributions to Wood Brothers history in their three seasons with us. The No. 21 Fusion will carry its familiar Motorcraft/Quick Lane colors in the season-ending Ford 400 on Sunday at Homestead-Miami Speedway.